About a decade ago, I received a Turkish cookbook from my friend Sevda’s mother, Mrs. Bulut. The cookbook is filled with loads of information about Turkish foods, traditions, and ways of serving guests. Reading through it recently, it made me feel a bit nostalgic for my own trip to Turkey, now almost twenty years ago. On that trip I met up with Sevda and her family, who took me around their home in Adana and in nearby towns. It was a wonderful trip, and was able to see places and experience new kinds of foods for the first time. Safely transported and guided by my hosts, this was the smooth part of my trip. Just before joining up with the Buluts, I spent a few days on my own in Istanbul. This was the not smooth part of my trip. My plan was one of a young college student in pre-Internet times (translation: poorly planned, poorly connected). In my mind, the plan was so simple – arrive in Istanbul and meet up with a friend I had met while studying in Italy. In a letter, I had sent information a few weeks ahead about my plans and arrival date. And here’s where problems one and two come in: 1. my friend was not there to meet me, 2. so I found an inexpensive hotel in which to stay until I could find him. A hotel so sketchy that I used my backpack as a pillow, and that backpack had been placed on every pigeon poop covered piazza in Europe. Even if you have never been to Istanbul, you may know this – it is one of the largest cities in the world. Having only my friend’s first and last name (no street address, no phone number, no idea what his parent’s names were), I figured I would walk to the post office, find a phone book, and start calling. In English. With this fine plan in mind, my first step was to buy a map so I could locate a post office. On the street and looking for a map, I walked past a rug shop and several men called me inside take a look at the rugs. Sure, I thought, why not. I’M 21 YEARS OLD AND I DON’T KNOW WHERE I AM AND NO ONE ELSE DOES EITHER, WHAT COULD GO WRONG (please note: the all caps is my adult-self shouting retrospectively at my young-woman-self). I entered the rug shop and the men started showing me some rugs. They asked me how I was enjoying Istanbul, and why I was travelling all alone, a young American woman. Sure, I thought, why not tell them the whole story. Beans spilled to perfect strangers, they were shocked and appalled that my friend had not come to pick me up, and decided that it was unacceptable. They called to have tea brought in from next door, rounded up their cousins from a neighboring shop, and set out to call every Parmaksiz in Istanbul. AND THEY FOUND HIM. AND MADE HIM COME PICK ME UP RIGHT THAT MINUTE. In the meantime, I bought a rug. From the most helpful rug salesman in Istanbul. Turns out, making manti is easier than tracking down a lost friend in Istanbul, but does take just about as many steps. Before we get into the details, I should state that I have NO idea how authentic this recipe actually is. There are many variations on manti, and I made a few non-traditional adjustments to the recipe to accommodate the tastes and food requirements of our household. They turned out to be really delicious, but it is very likely that they are different than those you might find in Turkey. Manti are very much like other kinds of stuffed pasta found around the world. Similar in form to pot stickers, ravioli, or tortellini, manti are made with fresh pasta, filled, folded, cooked, and topped with sauce. Sometimes they are dropped in boiling water like their Italian counterparts, other times they baked. I opted for the baked version because I felt like they would be less likely to fall apart, which can sometimes happen when filled pasta is dropped in boiling water. Since this process is somewhat labor intensive, I prepped some of the ingredients in the morning. Part of this recipe includes baking the manti in a pan filled with broth, and I wanted to be sure that the broth was great. I decided to start out by making stock out of beef shank, then using the beef from the shank as part of the filling. With the broth made and the filling in the refrigerator, Sophie and I set out to make the dough and assemble the manti together. My original thought was to use the pasta roller to create the pasta squares, but found that the dough did not hold up well that way. A rolling-pin on a lightly floured surface proved to be the most simple and fastest way to crank out the squares we needed. 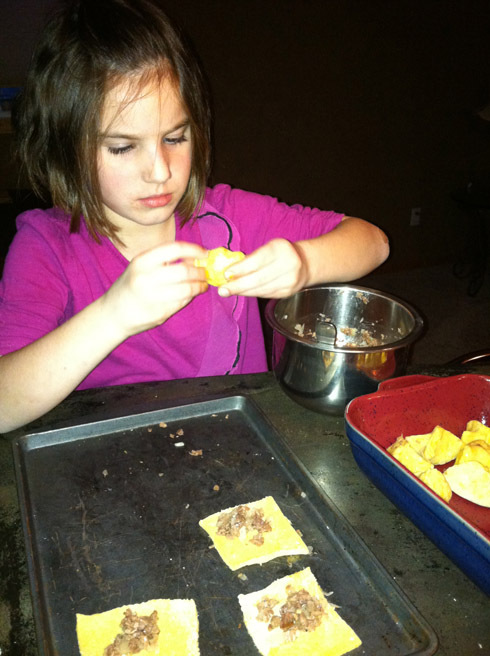 Sophie took on the task of filling and folding the manti. She’s a pro. After the manti are shaped and placed in the pan they are baked until they are slightly hardened and start to turn color. Then, the oven temperature is increased, the pan is filled with hot broth, and returned to the oven to bake until most of the liquid had been absorbed. The result was a combination of chewy, crunchy textures and perfectly cooked outsides. While the manti were soaking up all that delicious broth, we made a simple sauce using garlic, non-dairy yogurt, tomato paste, and broth. A light pink sauce, this flavorful sauce would be delicious on any pasta or served over chicken. I’ll definitely make that part again. In a stock pot, heat 1 T. oil over medium high heat. Add beef shank and brown on both sides. Add onion, carrots, and celery, cook for 4-5 minutes, stirring frequently. Add 1 c. water and stir up browned bits. Add remaining water and bring to a boil. Reduce heat to low, cover, and cook for one hour. Remove the beef shank and set aside. Strain and discard solids, reserve the liquid. When the beef has cooled, remove the fat and bone, cut remaining beef into tiny bits. Combine meat with the rest of the meat filling ingredients, salt and pepper to taste, stir, and refrigerate until ready to make manti. In a large bowl, mix together the dough ingredients by hand adding water until a dough forms. Knead on a lightly floured surface for a few minutes until the dough is well mixed, but not so long that the dough becomes tough and overworked. Cut into four pieces. Roll each piece on a lightly floured surface until it is as thin as you can get it. Cut the dough into 2-3” squares and set aside. Spray a casserole dish with cooking spray. If the reserved beef stock is not already warm, heat the stock. Preheat oven to 350 degrees F.
Place about 1 t. of the meat filling in the center of each square. Bring the corners together to the middle and pinch the sides together to form a sealed X shape at the top. Some of the dough may not be exactly that shape, just be sure that all of the seams are pinched together tightly. Place the manti in the casserole dish so that they are close together but not touching if you can help it. Bake the manti for 20 minutes. Remove from oven, and increase heat to 400 degrees F. Pour hot stock over the manti so that they are almost fully covered. Return to oven and cook for 30-40 minutes or until almost all of the broth has been absorbed. In the last few minutes of cooking, prepare the sauce. In a small saucepan over medium high heat, add oil. When oil is hot, add garlic and cook for 1-2 minutes. Add tomato paste, 3/4 c. reserved beef stock, soy yogurt, and cayenne pepper. Add salt and pepper to taste. Reduce heat to low and keep warm until ready to serve. 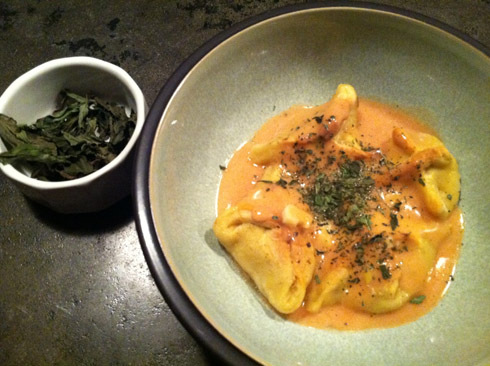 Divide manti between four bowls, spoon sauce over the top, and sprinkle top with dried mint. – You could make this an easier dish to prepare by using pre-made broth instead of making your own. And if you’re skipping that step, any cooked beef would be a fine substitute for the beef shank. – Although I didn’t try it, I bet wonton wrappers would make a decent substitute for the pasta, but the cooking time would definitely be different. – If I were making this for just myself, I’d also add more cayenne than I used here. Sent to a new friend of mine who was also born in Turkey, her name is Susan if you hear from her. Do you still have the rug? Is it magic? I absolutely adore manti. Your daughter looks like she did a beautiful job! And what an amazing story about your trip to Istanbul. Are you still friends with the guy? 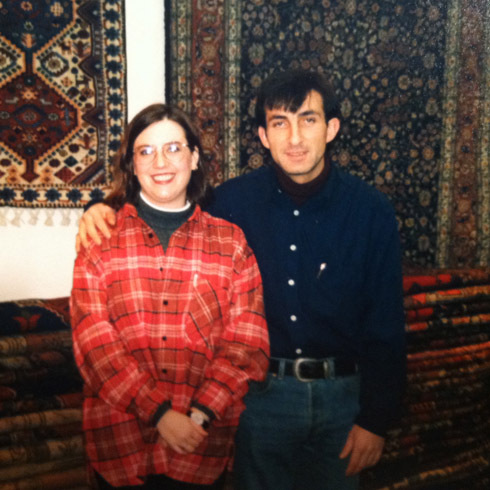 Jenine – the rug is still at my parent’s house, hanging on the wall. So, obviously it must be magic. Sophie did do a great job, I was glad that she wanted to help and even more glad that they stayed together. And after almost twenty years, I am no longer in touch with the guy.